This is a May Day rally? We waited around for a while to see if anything would happen, but nothing did. 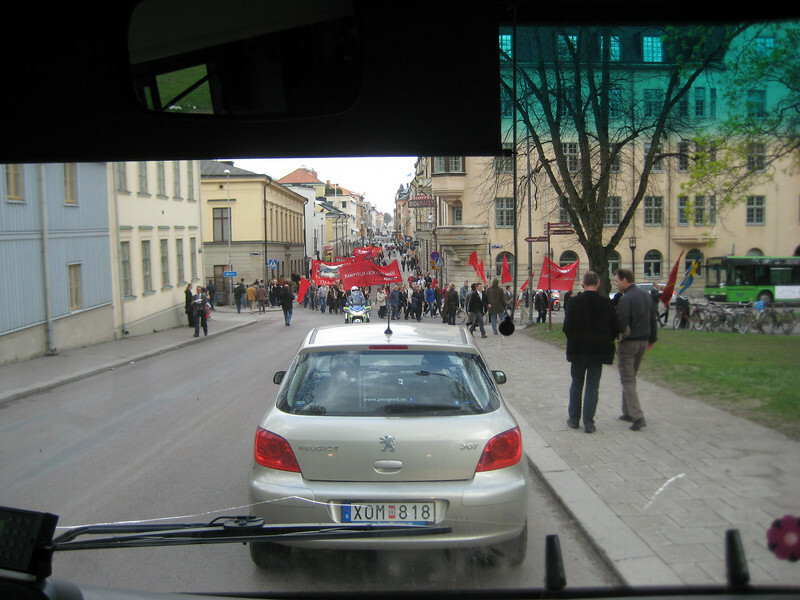 Greatly disappointed, we got on a bus to head back down Drottninggatan into town... when a rally came to us. This looked a little more promising! The bus driver grudgingly let us and several other people hop out. This group looked like the group featured in the poster on the left, above, as their signs called mostly for US withdrawal from this and that. Nothing particularly communist about that, but hey, at this point, any rally would do. 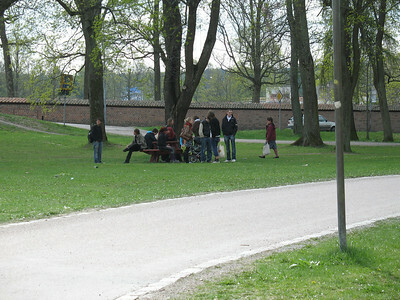 Here at last, about an hour later than advertised, were the people who were meeting in the English park. Their banner proclaims (in English) "Bangin' On The System." Their message remains unclear. And then, while watching this march, yet a third group came into our view across Drottninggatan, massing in the area behind Akademihotellet where we first stayed when we got here. 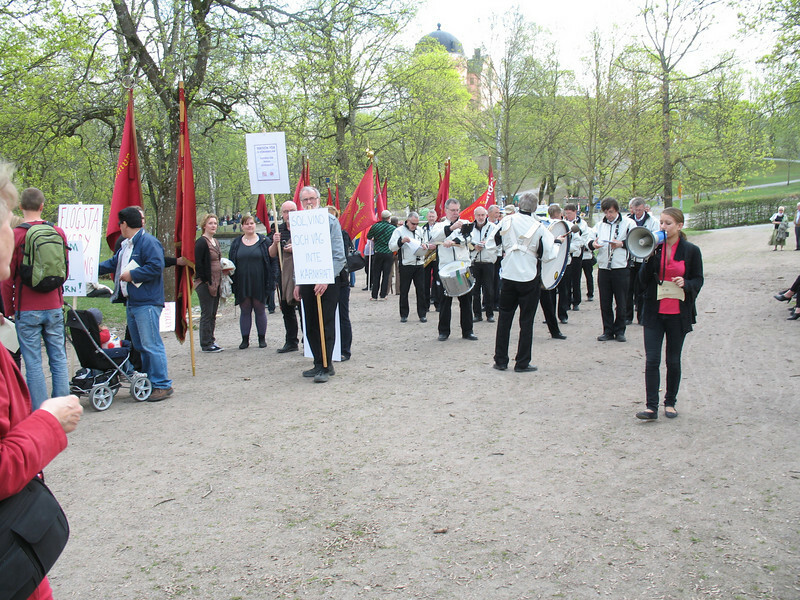 This group had a oom-pah band dressed in white uniforms, playing marching music. For today's purposes, oom-pah band trumped young man with guitar, so off we scurried to see this bunch were up to. This third group had lots of signs, a variety of causes, and a fast-growing crowd. I was handed a piece of A4-sized paper with slogans to chant, and a red piece of A6 that said across the top "Rött kort åt regeringen." I saw the word "Socialdemokraterna" on the same card and had a moment of panic, but a glance at the multi-ethnic crowd with sensible shoes reassured me that I had not accidently joined some skinheads. This group was handing out signs, and I think they had pre-made blank signs, so that you could also write your own message if you preferred. A very egalitarian "bring your own cause" sort of crowd. 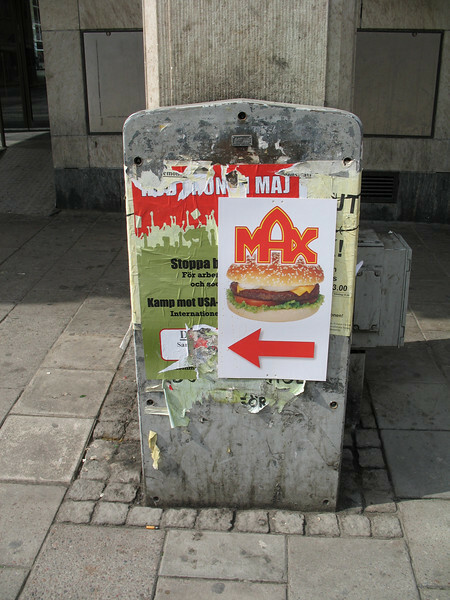 And I saw some signs that you probably don't see much back home, for instance "Högre skatt" and "Nej till privat sjukvård." My personal favorite was in rhyme: "Uppsala utan bussar är som kärlek utan pussar." The first group (the ones who started behind the library and then marched out and interrupted the second rally) turned out to be Syndikalisterna (who knew there were still syndicalists around!). 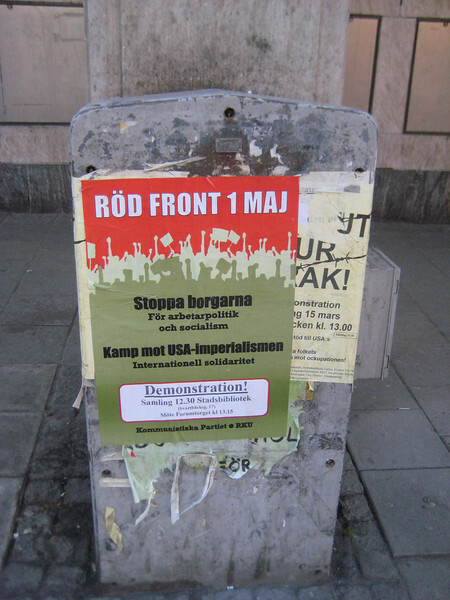 The second group (the ones we saw out the bus window, who had the rally just below the castle, and a real live Palestinian and the cute bullhorn girls) was Vänsterpartiet, the actual communists, even if they don't call themselves that anymore. 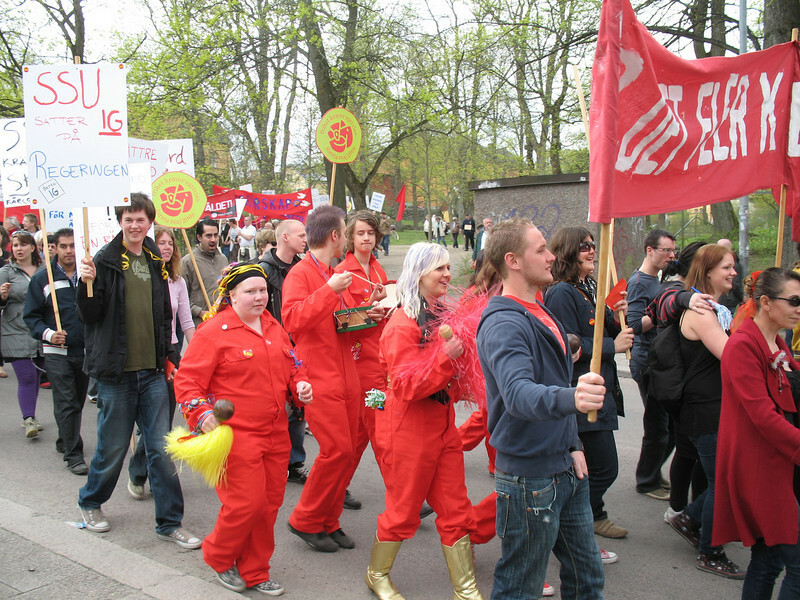 The third group (the one that met behind the hotel, had the oom-pah band and the most people, and also interrupted the second rally) was Socialdemokraterna [volume and work warning! as of today, this site plays a loud video first], which was Sweden's ruling party for decades before losing in the 2006 elections. Phew! What a day! I set out hoping to see just a communist or two, and I got parades of them, with Social Democrats and Syndicalists to boot. Really, I wish these revolutionary groups would get their acts together and coordinate better so that they don't overrun each other so much, and... oh. Right. 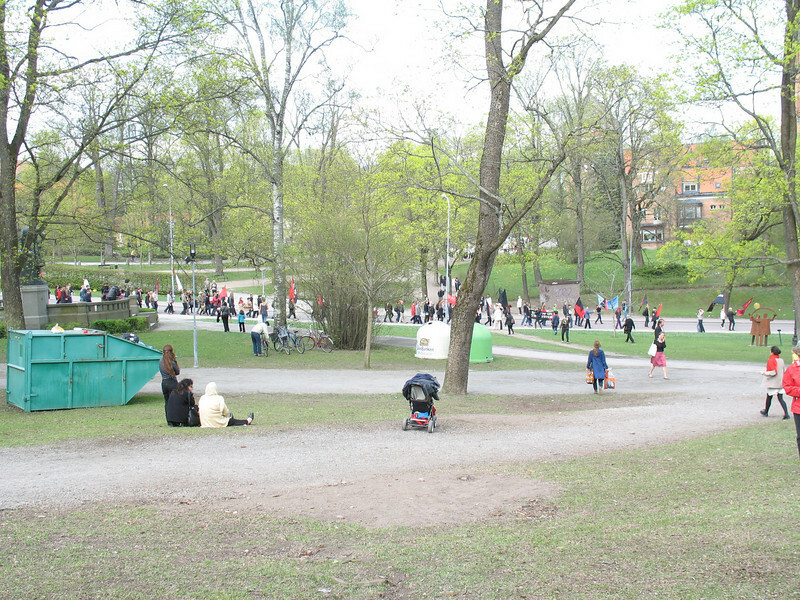 Well, left-leaning groups in Sweden do have one thing in common: they all start late. 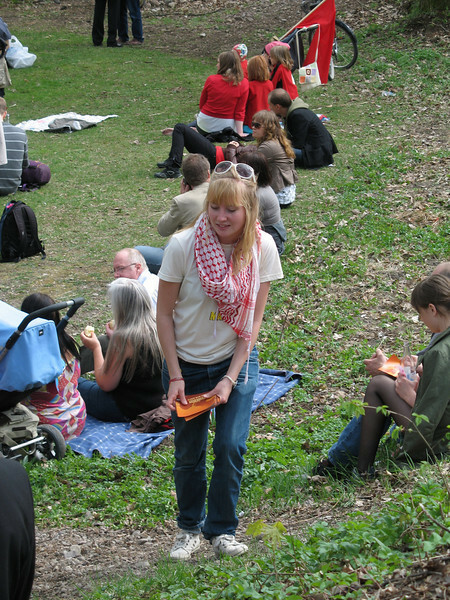 Too much fun yesterday at Valborg, I suppose.